Distracted driving accident is the top cause of auto accidents. Eating, grooming, changing music or controls, and dealing with kids in the backseat while driving has always created a level of distraction for motorists. The dawn of the smartphone, however, has taken distracted driving to an entirely new level. 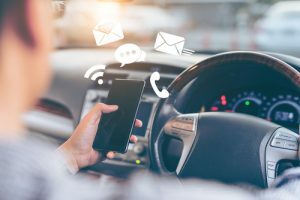 Now, texting, talking on the phone, and even watching videos or checking social media while driving has become the reason many people are involved in car accidents. Ever wonder how you got from point A to point B while driving? If you can’t recall going past certain landmarks or intersections, you may have been daydreaming or distracted. Either way, your brain was multitasking, a behavior that that automatically puts you at greater risk of being involved in a car accident. Traveling at a speed of 55 mph while focusing on your smartphone is the equivalent of driving the length of an entire football field, blindly. Even if you’re “only” talking on a smartphone while driving, your field of vision is narrowed. The part of the brain that processes moving images decreases by a third when listening to someone talking on the phone. You can miss up to 50 percent of what is around you while distracted, including other motorists, pedestrians, bicyclists, and motorcyclists. Work-related calls, messages, and emails may seem like something you can’t miss, even on your commute into work, but car crashes are the top cause of workplace deaths. Ninety-four percent of car accidents are the result of driver error. And that means nearly every car accident is preventable. Though the brain can quickly move between two tasks, it simply cannot do two things at once. If you’re doing anything other than focusing on the job at hand when you’re in the driver’s seat, you’re multitasking, distracted, and increasing the likelihood of causing a car accident. You may feel like the following behaviors are good driving habits that help you avoid distracted driving but, in fact, they are just as dangerous as holding your phone in your hand and may cause a distracted driver accident. Going hands-free: Speakerphone and Bluetooth are ways to communicate in the car without a smartphone in hand, but they create a false sense of security because you’re still distracted by the talking and listening. Plus, studies have shown that voice-to-text use is even more distracting than typing a text by hand. No matter how you’re talking or writing to someone, doing so while driving is a distraction. Built-in GPS: Maybe it seems like a dashboard GPS system is safer than looking down at your cell phone when using a navigation app. Neither option lends itself to safe driving. It’s hard to get around this level of distraction though. Unless you have a navigator riding shotgun or you know exactly where you’re going, you’re going to be distracted when using a map to get where you’re going. Infotainment: The AAA Foundation for Traffic Safety found that drivers who use infotainment systems for voice tasks are distracted for nearly 27 seconds after completing the task. Just because a system is built into your dashboard and in your line of sight, that doesn’t mean it’s safe to use while driving. Even if you’re sitting at a stoplight, picking up your phone for two minutes is a hazard. The brain must refocus again when the light turns green and that is a dangerous level of distraction. Involved in a Michigan Car Crash with a Distracted Driver? Distracted driving behavior mimics drunk driving behavior, and the results can be just as deadly. If you were involved in a car crash with a distracted driver, contact Thurswell Law for a free consultation. Our distracted driver accident attorneys have the experience to get you the compensation you deserve. We do not charge any fees unless you collect. Call (248) 354-2222 today to schedule your consultation.